Blondie and Brownie: The Prospect Park Uncle Louie G’s is Gone, Long Live J T Ices! The Prospect Park Uncle Louie G’s is Gone, Long Live J T Ices! Summer is officially here. It’s officially hot. And as Blondie pointed out, it’s time to eat ice cream. For those with plans to hang out in the environs of Prospect Park South, I have some excellent ice cream related news. Uncle Louie G’s is gone. How could that be good news? Well . 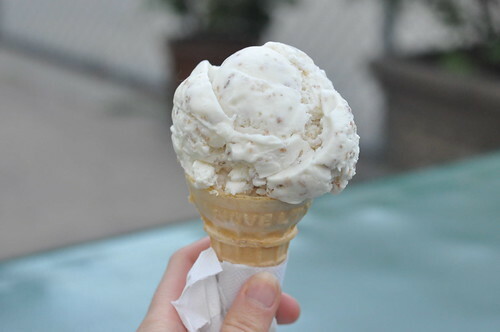 . . J T Ices has opened in its place, a new ice cream venture by the original Uncle Louie G’s founder and they’re bringing back Grape-Nuts ice cream . . .
As a born and bred New Englander, I’m awfully fond of any dessert that features Grape-Nuts (Grape-Nuts Pudding, anyone?) and I was really sad when Uncle Louie G’s stopped carrying Grape-Nuts Ice Cream a few years back. According to the employee I spoke to, the company’s founder, John Russo, sold the business and he wasn’t pleased with the quality of the product after he left—he was actually getting complaints from customers that the recipes tasted different and that the lemon ice lacked the little bits of zest that they used to have in the old days. The menu isn’t quite as extensive as Uncle Louie G’s, but I am excited to try the Green Tea ice cream. The Grape-Nuts ice cream was a good as I remember it, but I have to say at $3.50 for a regular the serving was modest and the person who scooped my serving broke the cardinal rule of scoopdom—she didn’t fill the cone with a half scoop. As a former scoop girl, I know from experience that it’s important to fill the cone with a half scoop because 1) it’s lame to have an empty cone and 2) it’s risky to have an empty cone, you’re one enthusiastic lick away from ice cream tragedy. If you’ve ever had a cone where you take one lick and the ice cream just rolls off that’s because the scooper didn’t add an extra little bit so the ice cream would have something to adhere to. I’ll give the scooper the benefit of the doubt, hopefully it was a one-time occurrence, but to be on the safe side, consider this your warning to be cautious when ordering a cone.